Mahabodhi International Meditation Centre is registered as Society under the Indian Society Act 1998 (1941 A.D.). Its registration no. 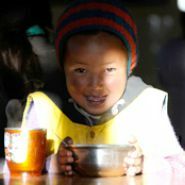 5635-RS/1041is as a charitable, non-profit, secular organization, to offer both desperately needed humanitarian services to impoverished people in the remote land of Ladakh. Venerable Bhikkhu Sanghasena has created an integrated community at Devachan campus which provides comprehensive care to all segments of its society: Children, elderly, special needs individuals, monks, nuns, sick, as well as those seeking spiritual development. The community has become a model for the region through sustainable, ecological development.